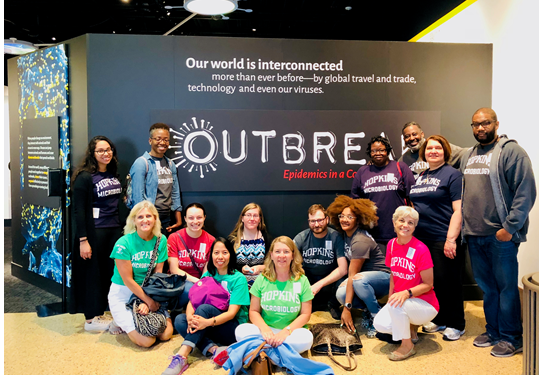 On the morning of Saturday June 23, 2018, fourteen members of the Microbiology staff attended a private tour of a new exhibit entitled “Outbreak: Epidemics in a Connected World” at the Smithsonian Museum of Natural History in Washington, D.C. 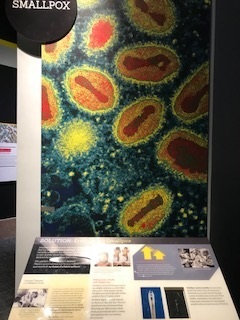 The Outbreak exhibit opened on May 18, 2018, and features historical information about the epidemiology of various viral diseases, including HIV/AIDS, the Zika virus, influenza, and smallpox. The displays describe how global travel, trade, and technology worked as mechanisms of the spread of disease, and how microorganisms “jumped” from animals to humans to cause worldwide epidemics. Measures taken to control transmission are also shown. 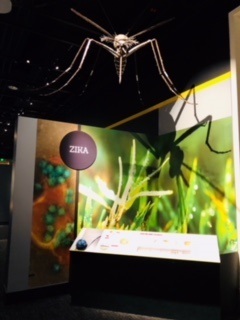 Displays of containment facilities, mementos from survivors, and a giant Aedes mosquito model are featured, as well as fun, interactive games and other hands-on activities. This is a well-designed, timely attraction for the general public. 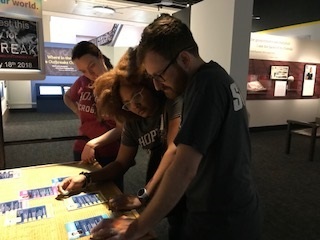 The tour was graciously led by Ashley Peery, public outreach fellow for The American Society of Microbiology (ASM) and educator at the Smithsonian. 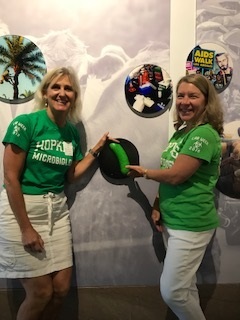 Our staff members were guided through the exhibit and given extra time to examine the displays and interactive materials before the general public was admitted to the Museum. 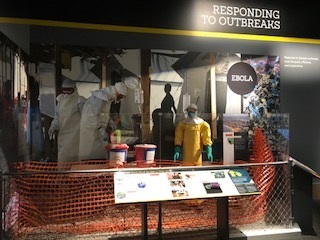 The Outbreak exhibit will remain on display at the Smithsonian until 2021 and admission is free. For more information, please visit the Smithsonian webpage, https://naturalhistory.si.edu/exhibits/outbreak/.